At 16:30, the Holy Father traveled by car to the headquarters of the Georgian Orthodox Patriarchate for the meeting with His Holiness and Beatitude Ilia II, Catholicos Patriarch of All Georgia. Upon arrival, the Pope was welcomed by the Patriarch. 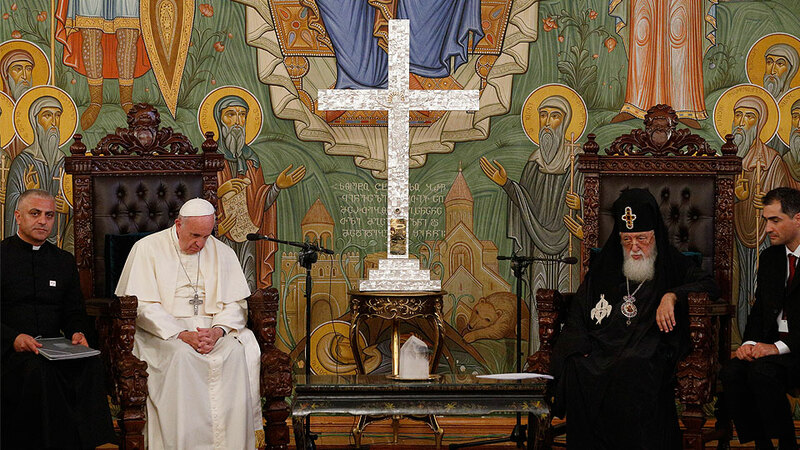 After the presentation of the delegations, Pope Francis and His Holiness and Beatitude Ilia II went to the Patriarchal Apartment for the private meeting. With the first historic visit of a Georgian Patriarch to the Vatican, Your Holiness opened a new chapter in relations between the Orthodox Church of Georgia and the Catholic Church. On that occasion, you exchanged with the Bishop of Rome a kiss of peace and a pledge to pray for one other. In this way, there has been a strengthening of the meaningful ties that have existed between our communities since the first centuries of Christianity. These bonds have been consolidated and are characterized by cordiality and respect, evident in the warm welcome given here to my envoys and representatives. Our ties are also manifest in the study and research projects being pursued in the Vatican Archives and at the Pontifical Universities by members of the faithful of the Orthodox Church of Georgia. So too, they are seen in the presence in Rome of a Georgian community who have received hospitality at a church in my own diocese; and in the cooperation with the local Catholic community, especially on a cultural level. As a pilgrim and a friend, I have come to this blessed land as the Jubilee Year of Mercy for Catholics approaches its conclusion. Saint John Paul II also visited here, the first among the Successors of Peter to do so in a moment of great importance on the threshold of the Jubilee of 2000: he came to reinforce the “deep and strong bonds” with the See of Rome (Address at the Welcome Ceremony, Tbilisi, 8 November 1999) and to recall how necessary, on the verge of the Third Christian Millennium, was “the contribution of Georgia, this ancient crossroads of culture and tradition, to the building... of a new civilization of love” (Address, Meeting with the Catholicos-Patriarch and the Holy Synod, Tbilisi, 8 November 1999). Thank you, Holiness. May God bless Your Holiness and the Orthodox Church of Georgia. Thank you, Holiness. And may you always be able to advance along the path of freedom.